2 CHICKEN BREASTS, ± 400 GR. approximately 1 hour, stir every 20 minutes.Meanwhile, put all ingredients for the avonaise in a small bowl and combine all ingredients with a hand blender until everything is thoroughly combined. Add salt and pepper to taste. Use a food processer to make the yellow salsa, add all ingredients and pulse until you have a thoroughly mixed but still course salsa. Salt and pepper to taste. Refrigerate for at least one our, to let all the flavors develop. Remove BBQ chicken from pan, take two forks and shred the chicken. Meanwhile heat the soft tacos in a grill or microwave. 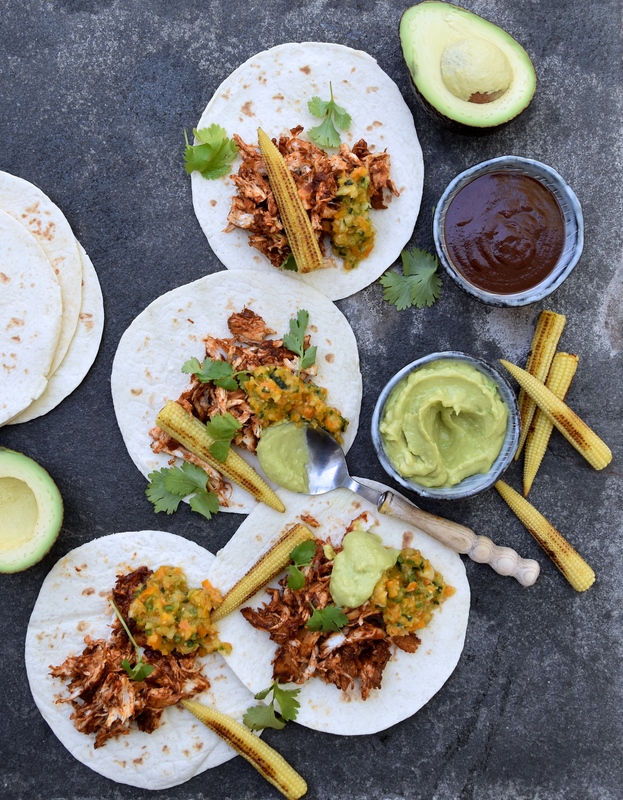 Serve tacos topped with BBQ Pull Chicken, yellow salsa, avonaise, fresh coriander, grilled baby corn + extra BBQ sauce.